Christian Alzmann draws for Industrial Light & Magic. He's the art director there. So he has worked on numerous Hollywood films. 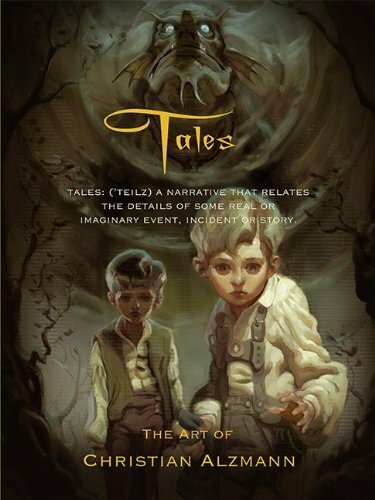 Tales is a personal compilation of his sketches and paintings, stuff that he creates at home after a full day's work at ILM. So there aren't any movie related illustrations included. The art's mainly characters and creature designs. Many look like fantasy creatures to me, a few are robotic ones. The sketches are detailed with fine art like shading. I bought the book thinking it was a graphic novel, even though the title suggests it's an artbook. It's probably due to the cover art. I like those concepts that imbue a bit of mystery and arouses curiosity. There's one with Gulliver from Gulliver's Travel being restrained underground subject to testing. The other one I like has three floating candles, and beneath it a strange person/creature with a huge white snake coiling around it, a black crow on it, and then there's a girl with a white luminous dress. The sketches have no notes while the paintings come with brief descriptions, and occasionally layout sketches. At the back is a step by step tutorial that looks at the painting process from sketch to the end. I'm surprised the example is digitally painted, or maybe I shouldn't be, but it certainly feels traditional, perhaps because many paintings have a preference for earthly toned colours. Some paintings have very visual brush strokes, and some you can see the texture of the painting surface. Interestingly for his contribution in the other visual development artbook Battle Milk 3, he used similar colour scheme. You can check out more work on his website. Some of the artworks in the book are there.